The RPV (Rural Pursuit Vehicle). Secondhand update. Company info page update. New link to Farmers Weekly Exchange - Buy & sell online, New links to: Tee Jet, Spraycare and Ernest Doe & Sons. The RPV (as in March whats new) is now in full production after completion of development. There are demonstration units available to try and we are now looking for more worldwide distributors. Please have a look at the RPV web site for more information. A new tilt cab and hydraulic power braking system has been developed for the top of the range Stealth TDI for launch at Sprays and Sprayers. Heavy duty, reduction hub axles introduced a year ago are now fitted as standard and a wider range of low pressure and row crop wheels are available to give up to 0.7m of ground clearance. The new tilt cab has solved the earlier space problem when the engine compartment used to be very cramped. It is now possible to expose the complete engine, transmission and front end of the chassis for servicing and repairs. 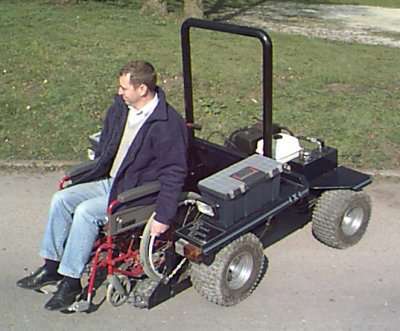 The RPV is an all new ATV designed specifically for those people with mobility problems. 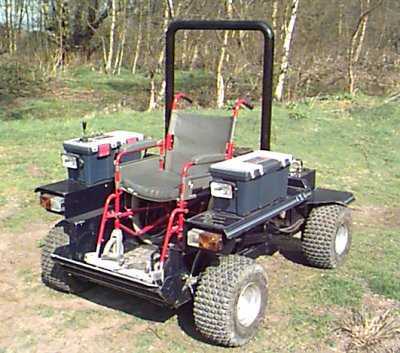 The vehicle allows total independence and freedom of access to the countryside. 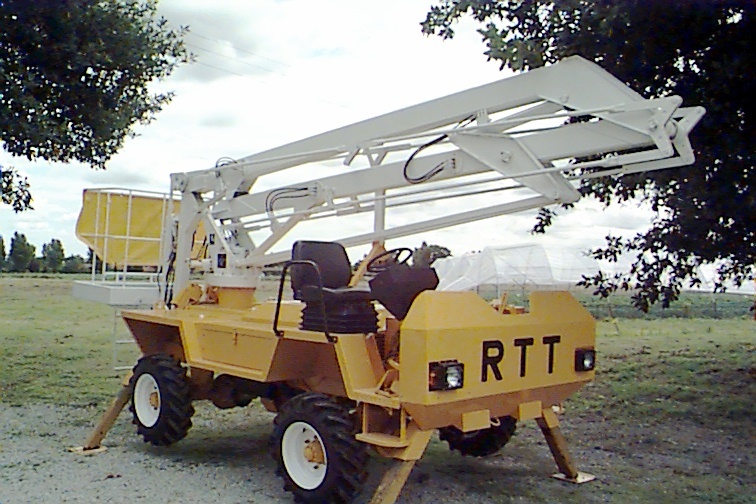 The unique and patented design front loading system means a wheelchair can be easily reversed onto the platform which is then raised hydraulically. The open fronted design makes it ideal for people to follow countryside pursuits such as fishing shooting and painting, it allows farmers to access the whole of their farms without fuss and will give a wide spectrum of disabled people the opportunity to access public areas that they would not normally have the opportunity to see. We are currently "fine tuning" and field testing the prototype and have a further three pre-production prototypes and demonstration units under construction. Full production is due to start by the beginning of June 2000. A new RPV website area is under construction to give more news and detailed information and a video should be available by late May. Please do not hesitate to e-mail us for further information. We have recently received an order for a top spec Stealth TDI for New Zealand - our furthest away export yet! This order was particularly pleasing for us as the initial lead was due directly to the power of the Internet and this web site. We are looking forward to installing the machine in April and also to exhibiting at their National Agricultural field days in June. A new video on the Stealth TDI together with a Factory Tour was made recently. Although not a top class professional job (made in house!) it does show the machine off quite well and shows a lot more of our factory and production process than we can show on the web site. Please e-mail us if you would like a copy. The 90 hp Ford XLD418 TCI (turbo/intercooled) engine is now being fitted as standard across the Agribuggy range (4D, 475 and 5D). The main reason is that the turbo engine that we have been using for the last 10 years is no longer available from Ford to the build specifification that we have been using. We can still get replacement engines and parts, of course, but getting engines built to our own spec would make the cost prohibitive. The extra horsepower from the upgraded fueling system and intercooler are a welcome boost to the specifications with very little increase in overall cost. Over the last 12 months over 90% of the sprayers we have sold have had the optional clean water tank washing system fitted. For this reason we have now decided to fit it as standard equipment. 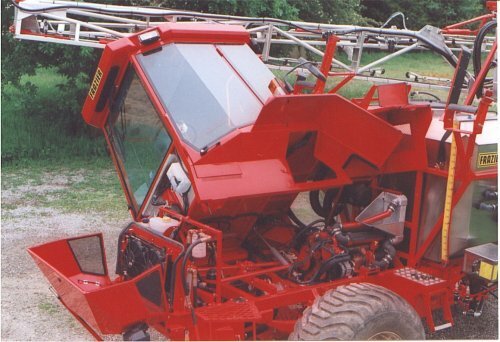 The system allows you to rinse the tank and spraylines with clean water and dispose of the washings without leaving the field. The clean water tank carries 10% of the main tank volume. The introduction of the new groundwater regulations have prompted us to introduce a new external wash down system to enable washing of the sprayer before leaving the field. The main spray pump is utilised to draw clean water from the onboard clean water tank and to pump it out through a hand lance fitted with a high pressure nozzle. 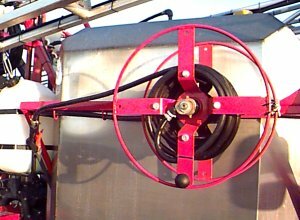 A reel is also fitted to carry the 20 metres of hose supplied with the unit.